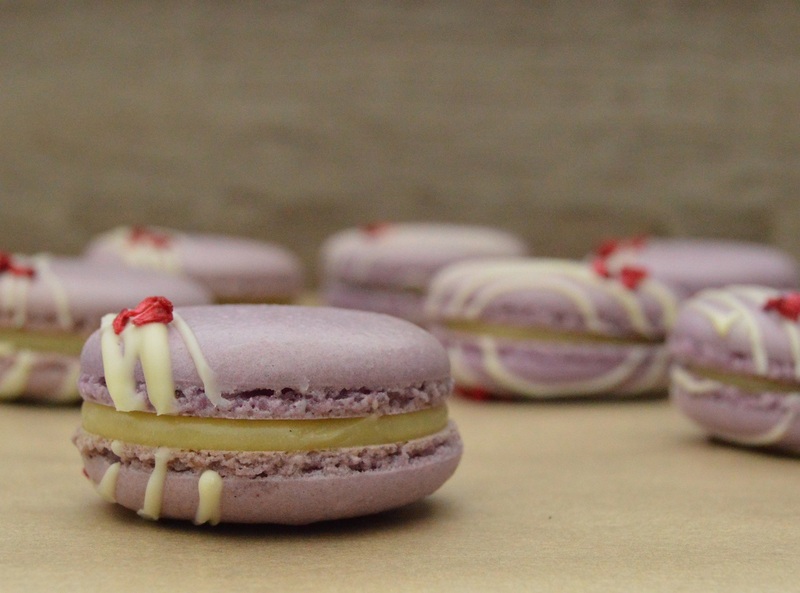 I adore passionfruit and I need no excuses to use its fragrant sharpness in a dish: these macarons are filled with a simple passionfruit filling which cuts through the sweetness of the shells. 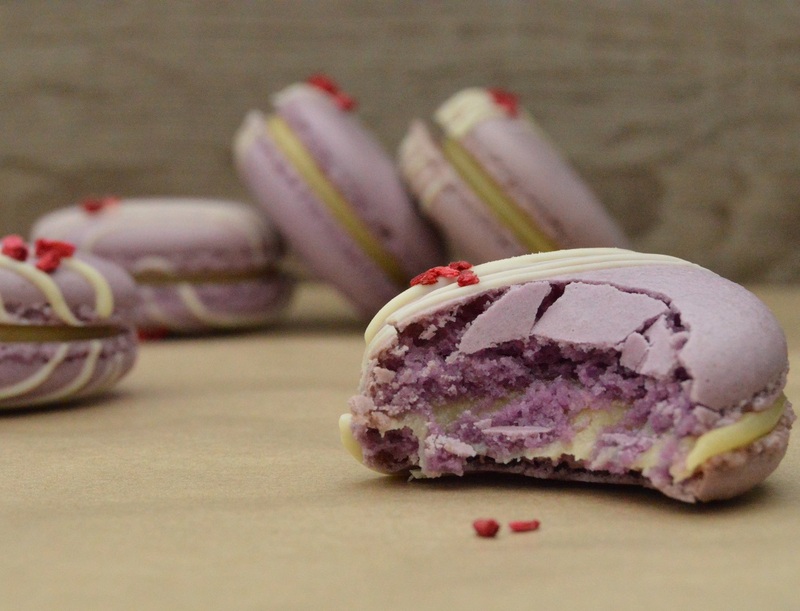 The macaron shells are lightly colured with purple food colouring powder, decorated with melted white chocolate and are sprinkled with dried raspberries (one of my favourite embellishments for sweet dishes! The filling is simply white chocolate mixed with passionfruit curd and a little passionfruit juice. In the UK the curd can be found in many garden centres and RHS properties, but I have been known to buy it online: given the amount of passionfruit needed to make your own, which I would with most other curds, it is easier to buy it. Mind you, I do push up the passionfruit flavour by adding fresh passionfruit juice. 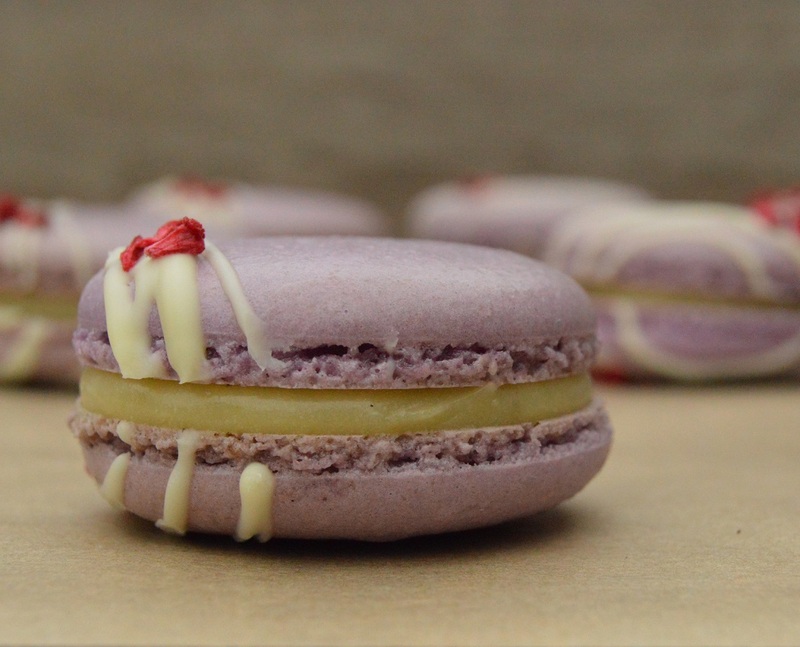 For the full instructions for making perfect macarons, my post on macarons is here. It is a long post, which also has a troubleshooting section and a Frequently Asked Questions section. NB: I always go for a French meringue as it is so speedy and it always works like a dream for me, but you can go for Italian meringue if you prefer. 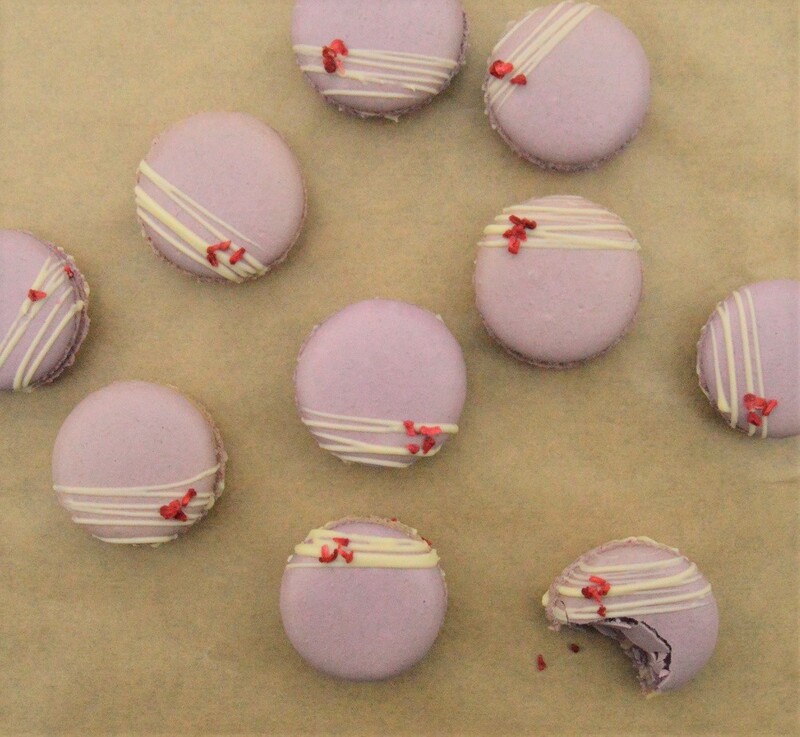 (1) Make the macaron shells as in the recipe link above and leave to cool before gently lifting them off the trays. (2) To make the filling, simply beat the chocolate, passionfruit curd and passionfruit juice together to give a smooth mixture. Chill until just set (enough so that it holds its shape). (3) Pipe or spoon the filling onthe macaron shells and sandwich together. Decorate in any way you wish – or even leave them as they are. (4) Place in an airtight container in the fridge ideally at least overnight for them to “mature”: the filling firms up and the shells gently soften up with the filling, becoming more melt-in-the mouth. Oh, they look PERFECT! As a Brazilian, passion fruit love is in my genes…. I doubt I could find curd for sale, and even frozen pulp is tricky. Sometimes we fnd the fruit but so very expensive…. would love to rey and make these…. thank you, as always Sally, and I bow to you with reverance as THE macaron queen. Oh yes I just saw your macaron post in my emails so am heading over now to drool….. I love the color of these macarons, and the way you’ve decorated them.